Shifu Mack began his instruction in Northern Dragon style Kung fu under the Chief Instructor of the art, SiGung Rex McCoy, PhD. After many years of intense training five, six, and in some years, seven days a week, twenty-plus hours every week, he joined the Instructional Staff Training Program at the Shaolin Kung fu Institute, and taught classes at the Hightstown, NJ, and Easton, PA, locations before opening the Shaolin Kung fu Institute Flemington. Shifu also trains in Ba Duan Jin Qigong, and Yang and Wu style Tai Chi, which continues under SiGung Rex McCoy. 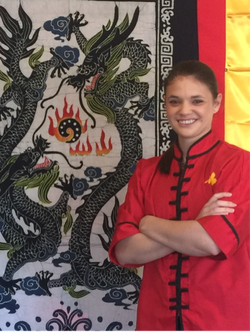 ​SiGung McCoy has certified and licensed Sifu Mack to instruct Northern Dragon style Kung fu. Shifu Mack holds a B.A. in English, and a M.S. Ed. in Elementary Education. He is also a state certified teacher with 17 years of teaching experience currently teaching 5th grade Language Arts and Social Studies. The Shaolin Kung fu Institute headquarters, in Hightstown, NJ, was formed in 1972 as the main location for training qualified students in the Instructional Staff Training Program. Those who pass the requirements of this program must complete all 4 sections and accompanying rank requirements of Northern Dragon style Kung fu, and must be active members in the Instructional Staff Training Program for 10 years or more. At the completion of this training program they become Certified Instructors of the Northern Dragon style of Kung fu and are licensed to use the emblem and the name of Lung Jop Pai® Kung fu. Shifu Mack also runs the Jedi Knights Kung fu Training Academy, a science fiction and Kung fu themed after school club for 5th and 6th grade students at the Reading-Fleming Intermediate School. Sije Ally began her study of martial arts in 1996. Over the past 20 years she has achieved her 3rd degree black belt in Tae Kwon Do and has attained the rank of Sije, or older Kung fu sister, in Northern Dragon style Kung Fu. 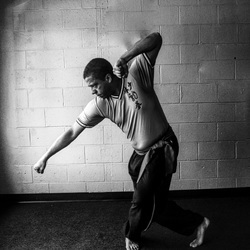 As an advanced student of the Shaolin Kung fu Institute's Instructional Staff Training Program for many years, Sije Ally continues to learn through direct instruction from Shifu Rex McCoy, the chief instructor of the art, expanding her knowledge of human physiology, traditional Chinese martial philosophy, and the thousands of years of history connected with the art. Sije hopes to show others that through hard work any skill can be achieved. In addition to her achievements in the martial arts, Ally has also competed at an elite level as a soccer goalkeeper at the high school, club, and college levels. She won several championships for the Montgomery Girls Soccer program during her four year varsity career. Through the experience she gained from the Players Development Academy (PDA) she was able to go on and play Division I soccer at both the University of Connecticut and, later, Monmouth University. ​Sije earned her B.S. in Criminal Justice and her Master’s Degree in Homeland Security from Monmouth University. She is an American College of Exercise certified personal trainer.